Considering a bicycle tour? 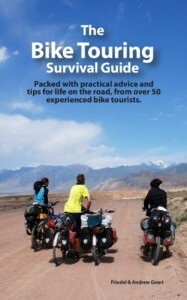 You must look at Bike Touring Survival Guide by Friedel and Andrew Grant. I have read a few books on the subject and was blown away by the quality of the content in their book. This is a 242 page ebook that is priced too low in my opinion. If you are not familiar with their website, you need to visit TravellingTwo to get great information for new and experienced bike tourists. They are a husband wife couple who traveled the world by bike a few years ago. Since then they have made numerous smaller tours and have walked away with invaluable experience to share with the rest of us. Besides their own experiences, they have asked their readers and friends to provide tips and tricks for inclusion in the book. In most sections of the book they have added real-life examples of why the information is important to know. For example, one of the contributors gave a tip about asking children instead of adults for where to find water. The difference is that adults will tell you where the store is to buy water. But children will direct you to a water hose or village pump that supplies free water. There is nothing wrong with buying water if necessary, but the writer was trying to avoid contributing to the environmental impact of plastic bottles. The book is full of tips just like this one. They tackle issues beyond the typical bike touring questions. Have you ever had to apply for a visa? Most of us have not; nor would we even know where to start. Read the Bike Touring Survival Guide and you will know exactly what steps you need to take to obtain a visa and when the process needs to be started. Are you a novice camper and have lots of questions about what you need to carry to live in a tent on tour? You will find your answers in this guide. They even provide a list of questions you will be asked over and over during your trip. They give some suggestions on the most diplomatic way to answer these inquiries. You can purchase the book for your Kindle through Amazon. This will deliver the file directly to your Kindle reader or Kindle app on your phone or computer. The only advantage to buying the book this way is that your book will be synchronized across your devices. Otherwise, buying it from the author’s website gives you more flexibility. When buying the book from their website you will get a PDF and a .mobi file. The .mobi file can be read on most ebook readers including the Kindle. They do not currently have an .epub version of the book (but are working on it). When it is done, the .epub version can be read on everything but the Kindle. The file you get when purchasing directly from them will let you read on your computer using the colorful PDF file, or read on your ebook reader with the .mobi. They say on their website that anyone who purchases the book now will be notified when the .epub version is available. The cost of the book through their site is currently €5. That worked out to a little over $7.00 (USD) when I bought it last week. The Amazon version of the book is $7.99. Enjoy the video introduction of the book below and then pick up your own copy. The authors guarantee you will like it or your money back. As a fellow reader I can’t make such a money back guarantee, but I would be surprised if you did not find this book worth the price.